Drought? Don't forget the trees! Water is the most limiting ecological resource for a tree, and without adequate moisture, decline and death are imminent. Drought can have a major impact on tree health and survival. 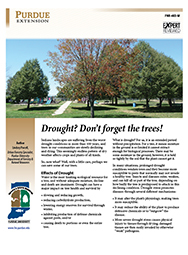 This 5-page PDF publication describes how homeowners can deal with drought-stressed trees in the short and long term.